RALEIGH, N.C. - A single mother of four from a small North Carolina town came forward Monday as one of three winners in a huge Powerball jackpot drawn earlier this month. For Marie Holmes, the best thing about the lucky ticket in the $564 million jackpot is that she'll be able to provide for her children, she said at a news conference. All are under the age of 7 - three daughters and a son with cerebral palsy. Holmes, 26, said she gave her mom $15 to buy five Quick Pick tickets at a Scotchman convenience store on her way to church. Holmes and her family live in a single-wide trailer in Shallotte, North Carolina - a coastal town of about 4,000 people just north of the South Carolina border. She worked at Wal-Mart, McDonald's and other places before recently quitting to stay home with her children. She didn't watch the Feb. 11 numbers drawing on television and didn't learn she held the winning ticket until the following morning. The winning numbers were: 11, 13, 25, 39, 54 and the Powerball 19. The odds of hitting the jackpot were 1 in 175 million. "I started screaming and jumping around," Holmes said. "I said to my kids, 'You just don't understand what this means.'" A couple weeks later, life is already different. Security staff now accompanies her everywhere, which she said is taking some getting used to. At the news conference Monday, she was flanked by a lawyer and a financial adviser. "It's not going to change the person that I am, but it is going to change our situation," Holmes said, according to CBS News Raleigh affiliate WRAL. Holmes said she'll take the lump-sum payment option of $127 million, which will total about $88 million after taxes. She said she'll tithe a percentage of the money to her church and charities. She has no immediate plans for what to do with her life after becoming a multi-millionaire but said she may go back to finish her college degree. Holmes also wants to travel, perhaps to Paris - she's never been outside the U.S.
"I am humbled and grateful for the opportunities this has created for my family," she said. Another of the three winners has elected to remain anonymous in Puerto Rico. The third winner, in Texas, hasn't come forward. The Texas Lottery posted on Twitter that one of the winning tickets was sold at Appletree Food Mart in Princeton, a city about 40 miles north of Dallas. 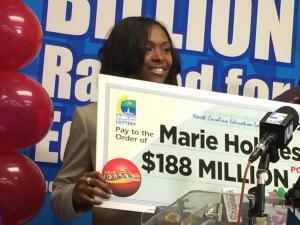 Holmes' win is the fourth time that a North Carolina ticket has claimed a Powerball jackpot. She is also now the largest lottery winner in state history, eclipsing a retired firefighter from Asheville who won $141 million in 2010. It had been nearly a year since a Powerball prize reached the giant number people have come to expect recently. That was last February, when someone won $425.3 million. In 2012, state officials who run Powerball and Mega Millions changed ticket prices and lowered the odds of winning jackpots in hopes the moves would increase the number of huge prizes and draw more players. The new rules worked, causing jackpots to repeatedly climb to record levels. More than half of the top 10 U.S. jackpots have been reached in the past couple of years. The Feb. 11 jackpot was the third-largest in Powerball history and the fifth-largest U.S. lottery prize. The last time a Powerball jackpot climbed so high was May 2013, when a Florida ticket won a $590.5 million prize, WRAL reported.